Nicolas Poussin was a great classical painter who some say painted secret messages in his paintings. It is there to see if the viewer can see it. One of his greatest paintings Et ego Arcadia is said to contain a hidden message. I think Poussin's painting may also contain hidden messages and the fun is trying to interpret them. "And many hearing Him were astonished, saying, 'Where did this Man get these things? And what wisdom is this which is given to Him, that such mighty works are performed by His hands! IS THIS NOT THE CARPENTER, THE SON OF MARY, AND BROTHER OF JAMES, JOSES, JUDAS, AND SIMON? AND ARE NOT HIS SISTERS HERE WITH US?' So they were offended at Him. The children could represent the Zebedee cousins of Jesus. Poussin is showing that Jesus has a family. He has aunts, uncles, and cousins. The Holy family fled to Egypt. Joseph in this painting is in the shadows wearing the red cloak representing Messianic bloodline. His cloak is not a bright as Mary's dress. It is Mary's bloodline that Poussin's seems to emphasize. Joseph's bloodline is the Messianic bloodline of David. Joseph is Jesus's adopted father because he marries the pregnant Mary. According to the Bible the Messiah will come from the bloodline of David which Joseph possesses but Jesus according to teachings is not of Joseph's DNA . Jesus does possess Mary's bloodline but is it the bloodline of David? Jesus father is God. Jesus according to the bible had brothers and sisters. The Holy family is barely talked about in the New Testament. Poussin brilliantly demonstrates that Jesus's family possibly was a bigger family. We see again Joseph in the shadows writing. Joseph was a carpenter but many equate that with masons. Carpenters needed to know how to build and geometry. Again Mary's red dress symbolizing her bloodline and Joseph's red tunic is in the shadows. Matthew traces Jesus bloodline through Joseph and Luke's genealogy starts from Joseph and ends with Adam. When Joseph adopted Jesus as his legal son, Jesus became both David's direct descendent through David's son Nathan (Mary's side), and David's legal royal heir through Solomon (Joseph's side). The promise had been given to King David, “Your house and your kingdom will endure forever before Me” (2 Samuel 7:16). 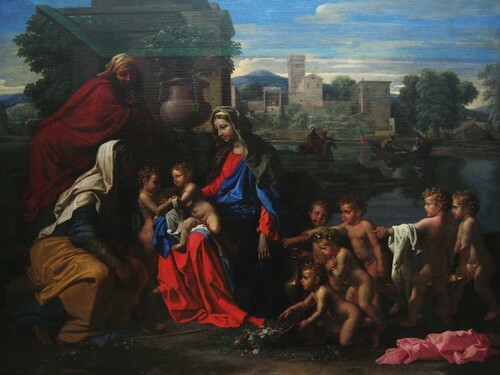 Poussin brings the Holy Family of Jesus on a bigger scale. He is showing the viewer that this family has many branches. We can only wonder if these brothers, sisters, and cousins had any children. It seems many were killed but who knows maybe their children did survive? Did the trees bear fruit?